One thing the enthusiastic beginner can be sure of: if he or she is in the market to get kitted out for the clubhouse, then there is no shortage of outlets that are willing to satisfy every requirement, from head to toe. Take for example, the internet. Typing "where to buy golf equipment" in to a search engine elicited over 21 million results and displayed page and after page of online retailers fighting it out to gain a share of an industry that annually turns over tens of millions of pounds in revenue. The advantages of these retail internet sites are, firstly, their accessibility. Many people have access to a computer and rather than negotiating the town traffic and searching for that elusive parking space, a golfing superstore can be merely a few mouse clicks away. In addition, because of the low commercial costs of a virtual shop compared to physical business premises, these internet sites can offer discounts on a wide range of products by different manufacturers, from sets of irons to bags, gloves, hats and caps. Returning to earth from the realm of cyberspace, many high-street sports stores, including a number that specialise in golf equipment, can be found in local listings while dedicated superstores can be found in some of the out-of-town shopping parks that have proliferated during the course of the past decade in Britain. Many players, particularly beginners faced with a bewildering number of different manufacturers for individual products, may prefer this more traditional form of shopping around because it allows them to physically handle the goods prior to purchase. Naturally this can be viewed as an advantage in any such transaction, but certainly in the case of clubs, for example, there is no such thing as an off-the-peg item. 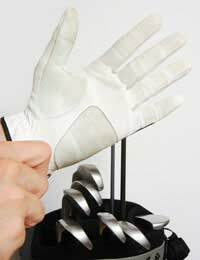 After all, golfers come in all shapes and sizes with aspects of technique that may make one brand or size of club better suited to their game than another. The only sure way to find out whether a club, either new or second-hand, is the one for you is to head for the practice ground and hit a few balls, preferably in the company of a coach or club pro who can observe how successfully the individual interacts with the golf club. For this reason, many players prefer the club shop rather than the high street or internet. There may not be the range offered by either of the above, and perhaps not the bargains also, but the advice of a professional can be ideal for those unsure about their requirements. For new players at a club it can serve to introduce them to the pro, initiating a dialogue that can have long-term benefits in terms of technical development. As players become more experienced, they develop a better understanding both on what they require from a particular item of equipment and, as often as not, the particular make they want and where to find it. This, in turn, makes the whole process of acquiring kit simpler and quicker, leaving more time to get on with the real business of playing the game.